Pizza comes in many different styles: thin or thick crust, how much tomato sauce (if at all), meats, cheeses, various toppings, and on and on. There is no end to the variations of what's become an icon in American foods, and everyone has their favorite. One of the best known styles of pizza is New York style, characterized by a thin crust that's pliable but still firm and crusty around the edge, light tomato sauce, and large slices which can be folded in half for easier eating. 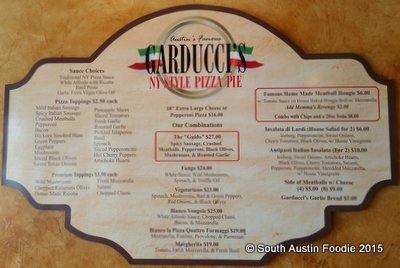 There's a new New York style pizzeria in South Austin called Garducci's, and they invited me out last week to try their pie. Disclosure: I was given a pizza but not monetarily compensated. 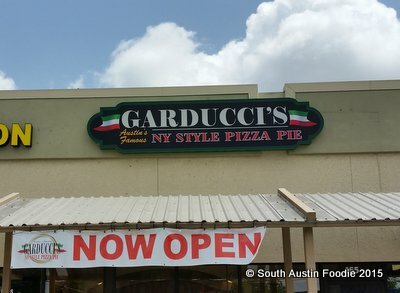 Garducci's is located at 730 W. Stassney Lane (the northwest corner at South First Street), in the strip center near the Baskin Robbins and Sonic just to the west. There are two high tables, but no chairs; it's very cute inside! They are take out only! No single slices, just whole pies, though they do have a meatball sub and a couple salads. They only offer one size of pizza, and that's an 18" pie, cut into 8 pieces -- the traditional New York way. 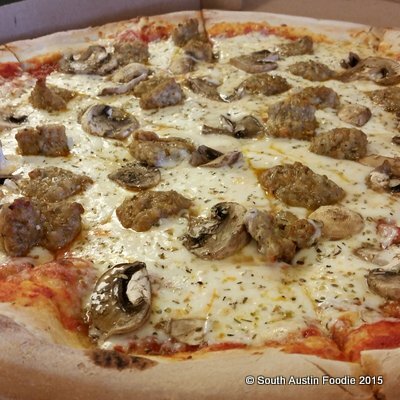 I put in my order for a sausage and mushroom pizza, which owner Paul made himself. 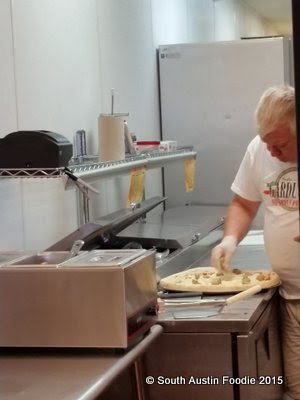 While the pizza baked in a 500+ degree oven, Paul and I chatted for a few minutes, and he gave me one of his meatballs to try. He has a culinary degree, and lived in New York City for a number of years, which got him well-acquainted with the pizza there. A variety of culinary jobs in some high profile establishments kept him busy over the years in Dallas, Las Vegas, and Los Angeles. 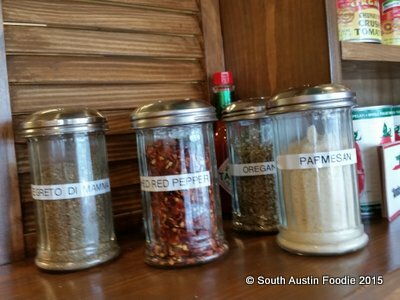 Paul heard of the opportunity here in Austin to open his own pizza place, and moved here in February. 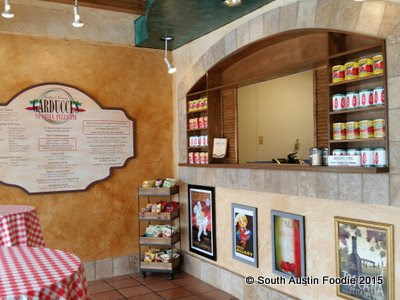 Garducci's opened up in May. Paul gave me one of his meatballs as we were talking. It's a traditional beef, pork, and veal, with a great oregano flavor. 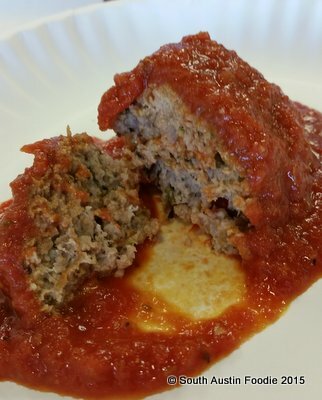 The meatball was super-tasty and tender! While I've never been a meatball sub person, they do offer just a side of meatballs or you can get them on your pizza! I could SO eat a side of them right now. Once the pizza was ready, I took it to my friend Mad Betty's house. She's a New Jersey native, so I figured she'd be a good judge of Garducci's pizzas. And while I am not a New York style expert, neither of us were disappointed. I was particularly impressed with the large chunks of sausage and the generous amount of toppings. Mad Betty noted the crust was nicely charred on the bottom, and the dough was nice and thin. The edge of the pizza was quite crisp, and there was not too much tomato sauce, which I appreciate. We both agreed that there was too much cheese on the pizza though! Paul did tell me he's using whole milk mozzarella, and he's certainly not skimping. While not a bad problem to have, on my return visit, I would ask for a pizza with about half the amount of cheese than normal. And looking at his 4.5 - 5 star Yelp reviews, the cheese seems to be the only complaint. Thumbs up Garducci's! That area of South Austin now has a great neighborhood pizza joint to call their own, something that was sorely lacking. So call in your orders, go pick up your pie, and sit back and enjoy an authentic New York style pizza pie experience. Mangia! You have us following all of your recommendations, now we need to give this place a try. Yum Yum! Thanks for always giving us the heads up! Thanks for reading Lisa! 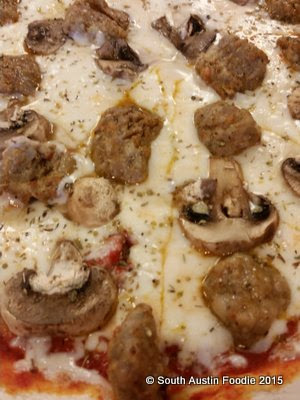 :) They have lots of toppings that could make a fabulous vegetarian pizza! Also, I stand corrected after an email from Paul yesterday thanking me for the post. They DO offer single slices, it just didn't make it on the original menu, but they should have a new one out any day now! Cheers!